Lian Li has built a reputation for quality and design with their aluminum cases over the years and the company has consistently been one of the biggest supporters of the Mini-ITX format. 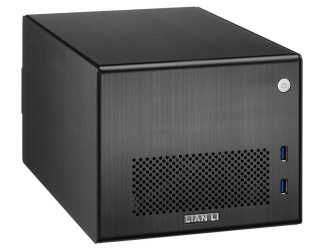 The Lian Li PC-Q16 is one of their cube-style Mini-ITX cases. To help trim a bit off the case’s girth, the PC-Q16 forgoes an ODD slot of any sort, but still manages to leave room for a 3.5″ HDD and three 2.5″ HDDs. The Q16 is definitely intended to be a looker with its brushed alumimnum and clean front face, Some folks will probably be dissappointed that there is no option for adding a flash reader and the lack of internal Blu-Ray options, but there are USB 3.0 ports to help make up for it. The PC-Q16 is definitely a tighter squeeze internally than some of the other Mini-ITX cases grabbing headlines over the last few months, but it looks like there might be a fair trade of function for form in this particualr case. Companies have been making computers and cases that will blend in with other home theatre items such as a reciever or DVD player. Lian Li is no exception and have put out quite a few great looking HTPC cases for MATX and ITX sized motherboards. They were kind enough to send the PC-Q16 case for us to review.